Staff Scientist, PhD, Chief of Spectroscopy Group. 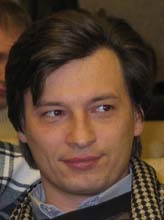 Bogdan S. Melnik was born 27.07.1969, Uzhgorod, Ukraine, USSR. 1986 - 1997 - Undergraduate student in chair of Biophysics, Department of Physics, St.Petersburg State University. 1994 - Bachelor's degree in Physics. 1997 - Master's degree in Biophysics. 1997 - 2000 - Ph.D. student in the Institute of Protein Research, Russian Academy of Science. He studied large oligomeric protein GroEL and developed software to analyzing small-angle X-ray scattering data to model the solution structure of GroEL protein. The results show that the model solution structure of unliganded GroEL differs from the crystal one due to changes of the interring distance as well as the position of the protein subunits and domains. He took part also in studying of fast folding/unfolding kinetics of apomyoglobin. Was proposed a method by using of that a complicated experimental chevron plot can be deconvolved into the rates of two separated transitions. His theoretical work has concern in developing of a simple approach to identify domain boundaries in proteins of unknown three-dimensional structure and analyzing of a systematic difference in residue contacts between X-ray- and NMR-resolved protein structures. Experimental and theoretical studies of a protein structures and folding. B.S.Melnik, A.A.Timchenko, K.Kimura, H.Kihara, K.Kuwajima, G.V.Semisotnov. The ligand induced large-scale conformational changes of GroEL chaperonin in solution demonstrated by small-angle X-ray scattering. EURESCO Conference and FEBS Advanced Course Biology of molecular chaperones 2003 august 30- sept. 4 Tomar, Portugal. Timchenko AA, Melnik BS, Kihara H, Kimura K, Semisotnov GV. A.A.Timchenko, B.S.Melnik, H.Kihara, K.Kimura, G.V.Semisotnov. Conformational plasticity of GroEL/ES chaperonins studied by synchrotron X-Ray diffuse scattering. Photon Factory Workshop on: New prospects of non-crystalline structural science by X-Ray and neutron diffraction/scattering. KEK, Tsukuba, Japan, 15-20, December, 2000. A.A.Timchenko, H.Kihara, N.V.Kotova, V.P.Kutyshenko, B.S.Melnik, A.K.Surin, G.V.Semisotnov. Conformation and stability of the co-chaperonin GroES. 2nd Workshop Principles of Protein Architecture Waseda University International Convention Center 1-6-1 Nishiwaseda, Shinjuku-ku, Tokyo December 12-13, 1995. A.K.Surin, I.A.Kashparov, H.Kihara, N.V.Kotova, V.D.Marchenkov, S.Yu.Merchenkova, B.S.Melnik, A.A.Timchenko, G.V.Semisotnov. Nucleotide action on the stability and conformation of chaperonin GroEL/ES. 2nd Workshop Principles of Protein Architecture Waseda University International Convention Center 1-6-1 Nishiwaseda, Shinjuku-ku, Tokyo Dec. 12-13, 1995.